This classic Baked Macaroni and Cheese recipe is easy to make & topped with crispy panko breadcrumbs. It's a kid favorite but sophisticated enough for adults! Is there anything more romantic than pasta for a stay-at-home Valentine’s Day? I obviously think not, which is why I’m sharing this recipe with you today. The thing is, Valentine’s Day falls on a Thursday this year. 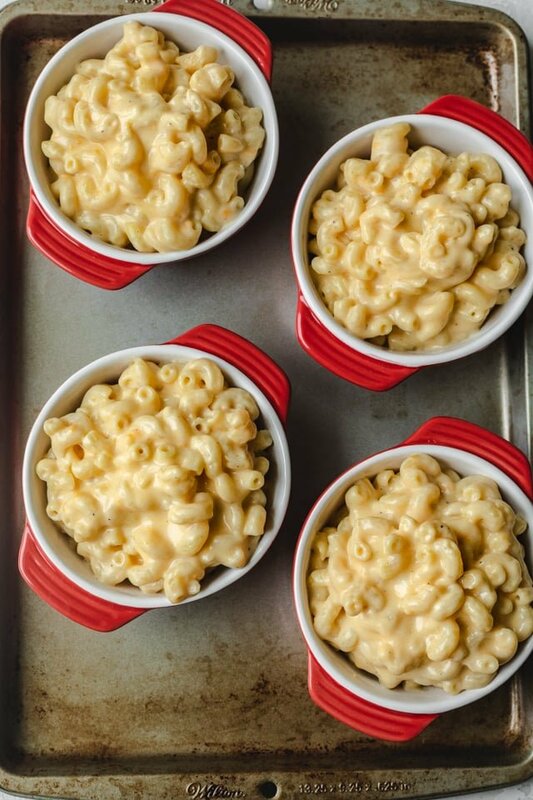 So if you’re a mom and date night out sounds unrealistic on a school night, this easy baked macaroni and cheese in cute red ramekins sounds much more realistic. And honestly fun! Start by making a roux. 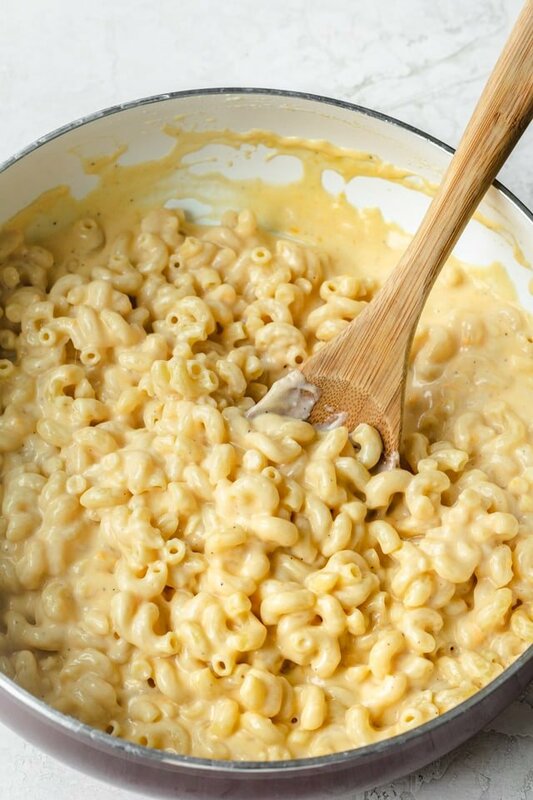 This is the most important step to for getting that creamy sauce and the perfect texture for the mac and cheese. Whisk together equal parts butter and flour until golden. Then whisk in the cold milk and break up any flour clumping. You’ll know the roux is ready when the mixture sticks to a wooden spoon like in my image below. Once the roux bubbles and becomes thick, add the cheese, some dijon mustard or powdered mustard, and salt and pepper. 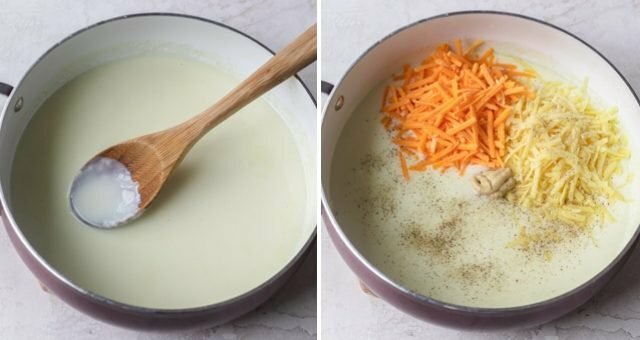 Mix the roux with the cheese until everything is well blended. And then add on the pasta. I used classic elbow pasta and I cooked it al dente since we’ll be baking it later on. When you mix everything together, it’s pretty much ready to go! But we’re making baked macaroni and cheese here, so we must be patient for just one more step – the baking! If you saucepan is oven-safe or you’re using a cast iron pan, you can top the mac and cheese with breadcrumbs and pop in the oven. Ok one more look at that extra cheesy velvety creamy sauce. You guys, it’s not everyday I cook things like this especially after that healthy month of January we had. 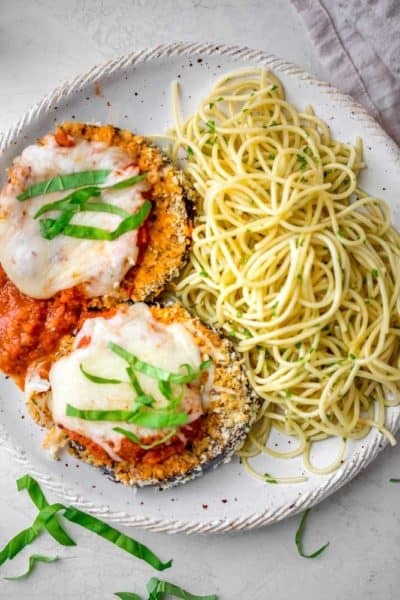 Yummm this is definitely one to try if you’ve been holding off on the pasta all month! 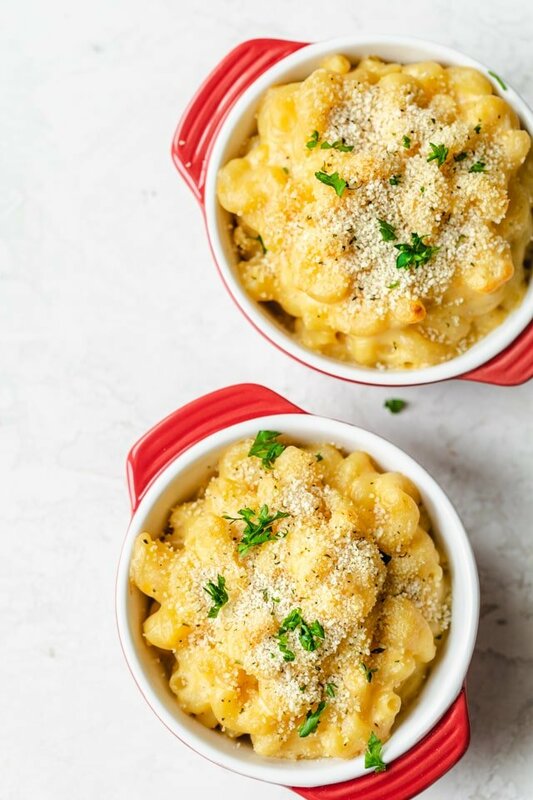 Since we’re making this baked mac and cheese recipe for Valentine’s Day, it’s fun using ramekins and dividing up the portions so it’s single serve in individual bowls. Scoop about 2 ounces of pasta into each ramekin and set the bowls on a baking dish. This makes it easier to place in the hot oven and remove it after it’s done baking. Sprinkle on some bread crumbs or panko breadcrumbs and bake them until golden and bubbly. 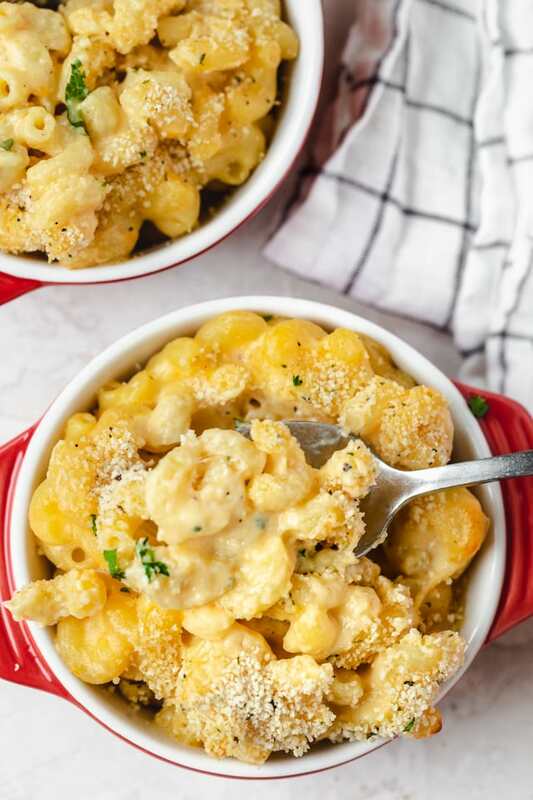 When they come out of the oven, the mac and cheese will be extra cheesy with a crisp golden topping and truly irresistible! 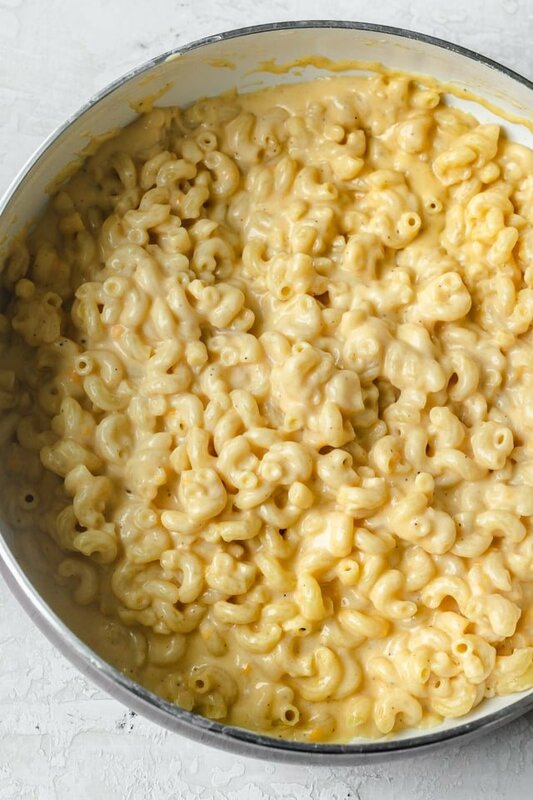 It’s so easy to make this homemade macaroni and cheese. We do buy the boxed stuff for quick lunches here and there. But there’s honestly nothing better than making mac and cheese from scratch. The flavor is just so much more rich and decadent. 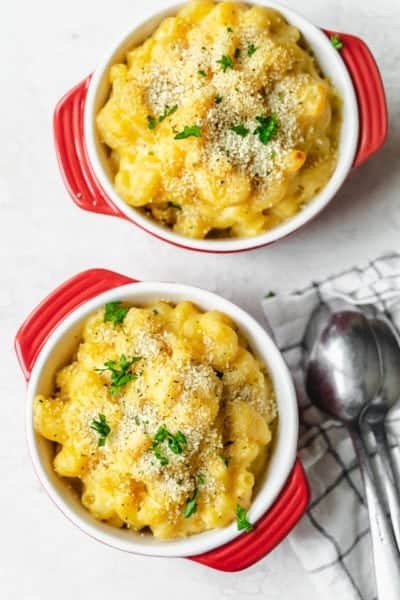 And what’s awesome about this baked macaroni and cheese recipe is that it’s a childhood favorite that all kids absolutely love, but it has a sophisticated flavor and texture that even adults would love. And I’m actually proposing these for Valentine’s Day this year – easy peasy cheesy night at home! I think this comes down to your preference. But generally most recipes will have 2-3 types of cheese. I use sharp cheddar and Gruyere, which is a very popular combination. You can make this with white cheddar, mild cheddar or medium cheddar. If you can’t find Gruyere, Jarlsberg Swiss cheese or regular swiss cheese works well. If you want to throw in a third cheese into the mix, I highly recommend mozzarella cheese, colby cheese or jack cheese. Cook pasta al dente, or two minutes shy of the recommended cooking time. You want the pasta to be slightly under cooked because it’s going to continue to bake in the sauce in the oven. If you overcook it on the stovetop beforehand, it will likely get too mushy and break apart while baking. Cool the pasta before tossing it in the sauce. Normally we want to coat the warm pasta in whatever sauce we’re making immediately. But doing so for baked macaroni and cheese can cause the elbow macaroni to absorb too much of the sauce and make it soggy after cooking. It’s a good idea to rinse the pasta after cooking, drain and allow it to cool while you’re making the sauce. Grate your own cheese for the cheese sauce. Store-bought shredded cheese is convenient and works well for topping the mac and cheese. 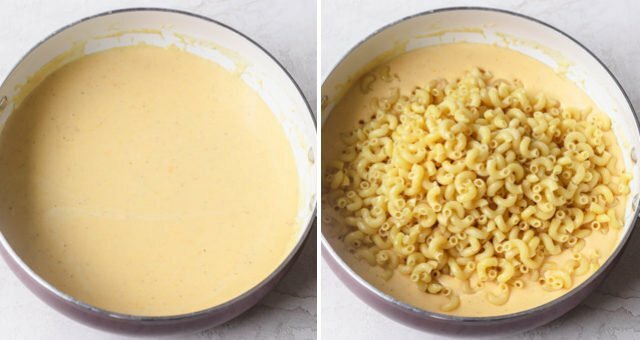 However it doesn’t work well for the cheese sauce because it has anti-caking agents which can prevent the cheese from melting efficiently and sticking together in the sauce. Also, it can sometimes have a powder residue or grainy texture from those caking agents. Use panko breadcrumbs for topping. I used regular breadcrumbs in my photos but panko in my video. I love the extra crunchy topping of the panko and I think it combines really well with the cheesy sauce. This is a fun and indulgent recipe that is buttery, cheesy and creamy! But hey, I did use 2% milk, so that’s something! But for reals, I know there are a ton of favorite baked mac and cheese recipes out there. This one is simple, easy-to-make and comes out so delicious, so I hope you give this one a try! It’s the cheesiest recipe on my blog! If you’ve tried this feel good Baked Macaroni and Cheese recipe or any other recipe on FeelGoodFoodie, then don’t forget to rate the recipe and leave me a comment below! I would love to hear about your experience making it. And if you snapped some shots of it, share it with me on Instagram so I can repost on my stories! Preheat the oven to 350°F, and spray and 8-inch square glass baking dish (or 6 ramekins) with cooking spray. In a large pot of boiling salted water, cook the pasta al dente according to package instructions. Drain, rinse and set aside to cool. In another large saucepan over medium-high heat, melt the butter, then add the flour to make the roux. Whisk the flour and butter until they are combined and golden, about 2 minutes. Slowly pour the cold milk into the roux, whisking as you pour. Add the Dijon mustard and season with salt and pepper to taste. Bring the mixture to a boil, then reduce to low and simmer, occasionally whisking until sauce is thickened, about 5-7 minutes. Stir in the cheese, then fold in the pasta. Transfer to an oven-safe baking dish (or dishes). Sprinkle with panko breadcrumbs. Bake until the breadcrumbs are golden and the edges are bubbly, about 20-25 minutes. Use other types of shredded cheese in place of gruyere and cheddar if you'd prefer. I made this on Valentine’s Day for my Valentine and it was DELICIOUS! The recipe was so simple but the flavor and seasoning was PERFECT! Thank you so much! 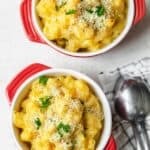 The easiest and best mac and cheese recipe i’ve ever made! !